M&M ‘s team sports twill embellishments will revolutionize your uniform model by using one product, in any number of colors, for all fabrics, and rapid delivery. Reduce inventories with low quantity orders and “print on demand” capabilities. Unlimited color print capabilities that replicates the rich color of screen printing. Add a faux finishing stitch to complete a professional sports look. 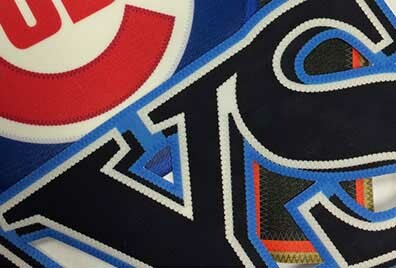 Faster delivery of product using heat press application vs. finish stitch application. The “No-Sew” feature uses only a heat press to apply embellishment to garment. This expedites the decoration process by eliminating sew-down step. Our low temperature adhesive allows our embellishments to work with all athletic performance fabrics.